Many iDevice owners are stuck with the official iTunes by Apple. If you are looking for an appropriate alternative, Leawo iTransfer should be a nice choice. 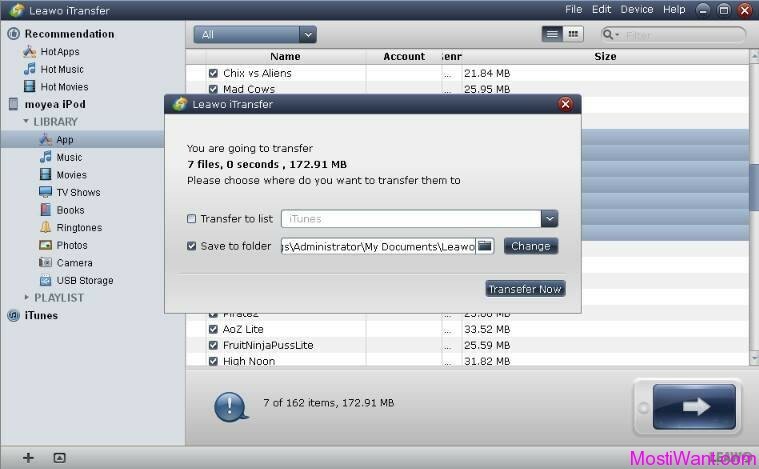 Served as an iPod transfer, iPhone transfer and iPad transfer, Leawo iTransfer is an all-inclusive file transferring tool which helps to finish file transference among iPod/iPhone/iPad/PC/iTunes with ease. With this iTransfer, you can transfer various kinds of files, including apps, music, videos, ringtones, books and photos. Unlike other ordinary ordinary iPhone iPod Transfers, Leawo iTransfer allows you to perfectly attaches great importance to the songs in your library that go great together. You can add items to the playlist or delete the existing items from it on the base of your preference, and even transfer a Playlist from old iPods to a shiny new iPod nano 7, iPod touch 5, iPad mini and all upcoming Apple devices. Moving it to friend’s iPod (or iTunes library) as a gift must be a big surprise! Plus, Leawo iTransfer allows to transfer apps across iPhone, iPad, iTouch and PC, with all the app data and the files associated with apps. Installing Apps with iTransfer, you don’t have to lose existing Apps – no need of jail-breaking! For easy file selection for transferring, this program endows you with flexible ways to sort out the required file sources. Smart filter sort out the target files for backup and transferring, so you can avoid file duplication among different devices. Moreover, you are able to get access to the target file in no time by employing the file search function. With The direct drag-and-drop and intuitive interface, you can transfer media files among different iPod, iPhone, iPad versions, computer and iTunes for sharing, backup easily. Leawo iTransfer is indeed one of the best iDevices transferring software ever for you to manage your multimedia files flexibly and smartly. Leawo iTransfer is normally priced at $19.95 per serial key. 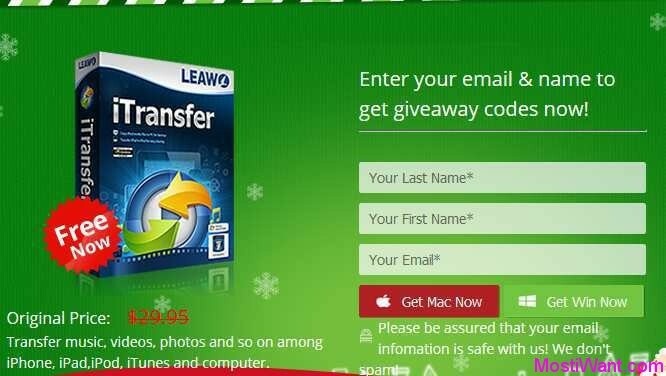 Leawo are having a holiday giveaway of Leawo iTransfer for PC & Mac, where everyone can download a full copy for free. The giveaway will be valid from today to January 11, 2016. Act fast to grab your free copy. Go to the giveaway page here, enter your name, email email, and click on the “Get Mac Now” or “Get Win Now” button to get your free serial key & download link. Usually you will get the email containing the license within 5 minutes. If the e-mail hasn’t arrived within 15 minutes, please check your spam, junk mail or promotions mail folder to locate it. You have to install and activate it (please connect to internet to register) before the Giveaway offer for the software is over. No free upgrades and technical support (including offline registration) will be provided for Giveaway Products. The idea is fine, but the program is poorly coded and plagued of bugs. It seems to be a Betta 1 version or post Alfa to say the least. It is too slow for my I7 laptop 8MB RAM and W7. It hangs every now and then. If you upload a song or tone the program bombs when finished uploading and after restart a convenient window asks for a report. When you sync with ITunes everything you uploaded disappears from your IPhone. I tried the program with my old 3GS. Of course I’m not mad enough to give a try with my IPhone 5. To the publisher: Please don’t sell Beta versions with lots of asserts in the code. Last line, I do not recommend this program, even I prefer not to figure out what’s doing in the background. Really nice find. Thank you very much Sharemore! Have a lovely day! Cool … MIW exclusive deal! I got a license code for Leawo Blu-ray Ripper. Tested and got a license for iTransfer. I have sent it to your email. Please check for it.